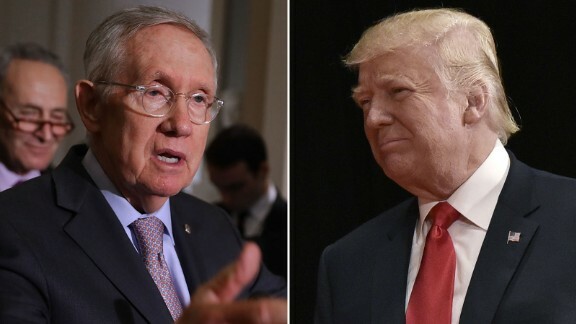 Senate Minority Leader Harry Reid had harsh words for Donald Trump. CNN's Manu Raju reports. Former Senate Majority Leader Harry Reid called President Donald Trump an "amoral" person and said he's "the worst President we've ever had" in an interview with The New York Times Magazine published Wednesday. "Trump is an interesting person. He is not immoral but is amoral," Reid, a Nevada Democrat, said in the interview. "Amoral is when you shoot someone in the head, it doesn't make a difference. No conscience." Reid, who retired in 2017 at the end of his fifth term, told the magazine that Trump "is without question the worst president we've ever had." "We've had some bad ones, and there's not even a close second to him," he said, according to the magazine. "He'll lie. He'll cheat. You can't reason with him," he added. Reid added that he disagrees with former FBI Director James Comey's frequent comparisons between Trump and a mob boss. "Organized crime is a business," he told the magazine, "and they are really good with what they do. But they are better off when things are predictable. In my opinion, they do not do well with chaos. And that's what we have going with Trump." "I disagree that Trump is a pessimist," Reid said, according to the magazine. "I think he's a person who is oblivious to the real world." Reid, who underwent surgery for pancreatic cancer in May 2018, also addressed one of the more controversial parts of his legacy: his decision in 2013 to change the filibuster rules on all federal court nominees. That change made it easier for the Democratic-controlled Senate to confirm former President Barack Obama's judicial nominees. However, it has also allowed the GOP to more easily confirm conservative judicial nominees after Republicans took control of the chamber and Trump became president. "They can say what they want," Reid told the Times. "We had over 100 judges that we couldn't get approved, so I had no choice. Either Obama's presidency would be a joke or Obama's presidency would be one of fruition."